Picture taken by Safri Ishak, Tebet Barat, 31-March-2010. Musim sokak atau melinjo merupakan musim ramai-ramai kekebun, Ayah yang manjat pohon melinjo, kemudian dengan galah buah melinjo yang sudah masak ditebak alias dipukul, kami dibawah, Mak kakak dan adik-adik, memungut buah yang jatuh. Sampai dirumah kulit buah melinjo dikupas, caranya kulit buah diiris memanjang mengelilingi buah, lalu kulit dilepas. Biji melinjo disangrai dengan pasir panas, kalau sudah masak dimasukkan kedalam pincuk daun melinjo dan dijual di bioskop Strand dekat pantai. Kadang-kadang melinjo dibuat emping, biasanya Mak membuat emping yang agak tebal, dijemur dan nantinya dibuat kolak melinjo, paling asik buat berbuka puasa. 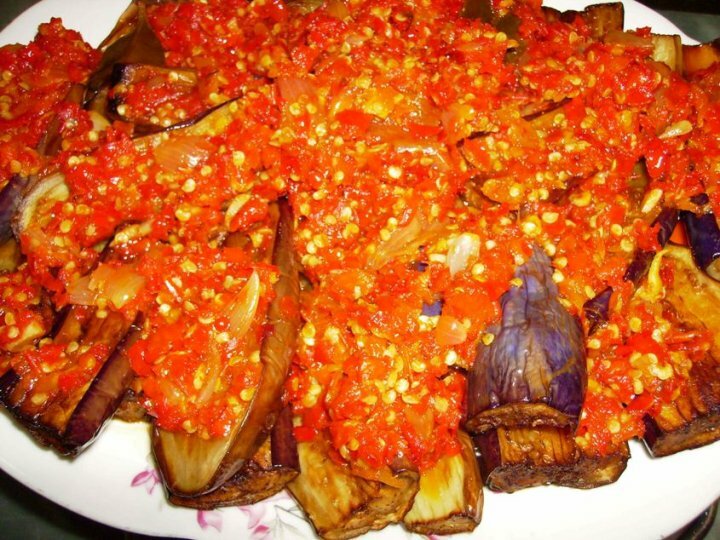 Yang saya tunggu-tunggu adalah saat Mak menumis kulit buah melinjo, bawang merahnya yang banyak dan biasanya dicampur udang basah dan irisan cabe rawit, enak sekali. Resep Tumis Kulit Melinjo ala Buk Neng. Picture taken by Safri Ishak, Tebet Barat, 08-April-2010. Terong Balado on FB Photo Album. More information about www.TB512.com Click HERE. Markets may be any of a variety of different systems, institutions, procedures, social relations and infrastructures whereby persons trade, and goods and services are exchanged, forming part of the economy. Markets vary in size, range, geographic scale, location, types and variety of human communities, as well as the types of goods and services traded. Some examples include local farmers’ markets held in town squares or parking lots, shopping centers and shopping malls, international currency and commodity markets, legally created markets such as for pollution permits, and illegal markets such as the market for illicit drugs. In mainstream economics, the concept of a market is any structure that allows buyers and sellers to exchange any type of goods, services and information. The exchange of goods or services for money is a transaction. Market participants consist of all the buyers and sellers of a good who influences its price. This influence is a major study of economics and has given rise to several theories and models concerning the basic market forces of supply and demand. There are two roles in markets, buyers and sellers. The market facilitates trade and enables the distribution and allocation of resources in a society. Markets allow any tradable item to be evaluated and priced. A market emerges more or less spontaneously or is constructed deliberately by human interaction in order to enable the exchange of rights (cf. ownership) of services and goods. The term "vegetable" generally means the edible parts of plants. The definition of the word is traditional rather than scientific, however. Therefore the usage is somewhat arbitrary and subjective, as it is determined by individual cultural customs of food selection and food preparation. Generally speaking, a herbaceous plant or plant part which is regularly eaten as unsweetened or salted food by humans is considered to be a vegetable. Mushrooms belong to the biological kingdom Fungi, not the plant kingdom, and yet they are also generally considered to be vegetables, at least in the retail industry. Nuts, seeds, grains, herbs, spices and culinary fruits are usually not considered to be vegetables, even though all of them are edible parts of plants. In general, vegetables are those plant parts that are regarded as being suitable to be part of savory or salted dishes, rather than sweet dishes.[who? ]However there are many exceptions, such as for example the pumpkin, which can be eaten as a savory dish, a vegetable, but which can also be sweetened and served in a pie as a dessert. Some vegetables, such as carrots, bell peppers and celery, are eaten either raw or cooked; while others, such as potatoes, are eaten only when cooked. 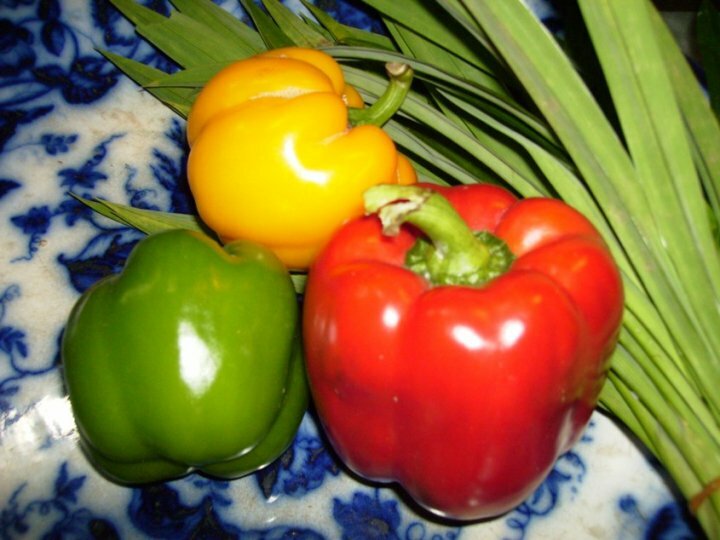 For many different kinds of vegetables, please see the list of vegetables. Vegetables are eaten in a variety of ways, as part of main meals and as snacks. The nutritional content of vegetables varies considerably, though generally they contain little protein or fat, and varying proportions of vitamins, provitamins, dietary minerals, fiber and carbohydrates. Vegetables contain a great variety of other phytochemicals, some of which have been claimed to have antioxidant, antibacterial, antifungal, antiviral and anticarcinogenic properties. However, vegetables often also contain toxins and antinutrients such as a-solanine, a-chaconine, enzyme inhibitors (of cholinesterase, protease, amylase, etc. ), cyanide and cyanide precursors, oxalic acid, and more. Depending on the concentration, such compounds may reduce the edibility, nutritional value, and health benefits of dietary vegetables. Cooking and/or other processing may be necessary to eliminate or reduce them. Parkia speciosa (petai, bitter bean, sataw, twisted cluster bean, yongchaa, yongchaak, zawngtah or stink bean) is a plant of the genus Parkia in the family Fabaceae. It bears long, flat edible beans with bright green seeds the size and shape of plump almonds which have a rather peculiar smell, characterised by some as being similar to that added to methane gas. The beans are an acquired taste, but are popular in Laos, southern Thailand, Burma, Malaysia, Indonesia, and northeastern India, and are sold in bunches, still in the pod, or the seeds are sold in plastic bags. Pods are gathered from the wild, or from cultivated trees, They are exported in jars or cans, pickled in brine. Depending on the country of origin they may be labelled peteh, petai, yongchaak, Zawngtah, sataw, or sator. 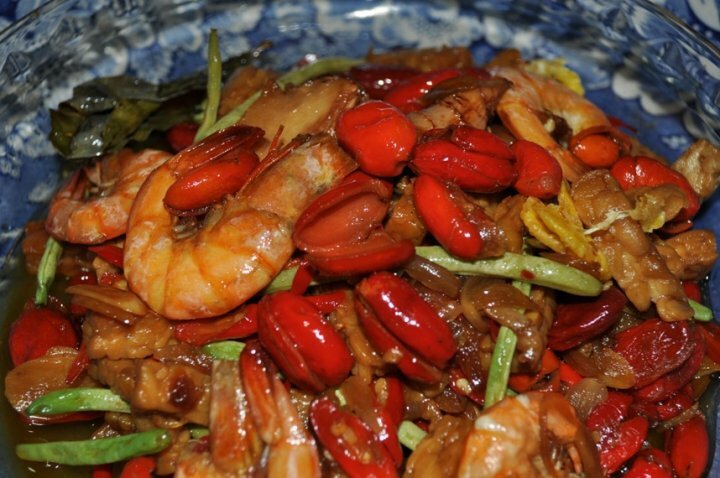 They are best when combined with other strongly flavoured foods such as garlic, chile peppers, and dried shrimp, as in "sambal petai", or added to a Thai curry such as Thai Duck Green Curry. When young the pods are flat because the seeds have not yet developed, and they hang like a bunch of slightly twisted ribbons, pale green, almost translucent. At this stage they may be eaten raw, fried or pickled. Young tender pods with undeveloped beans can be used whole in stir-fried dishes. In Manipur, a north-eastern state of India, the seeds or the bean as a whole are eaten by preparing a local delicacy called Iromba or Yongchak singju. Seeds are also dried and seasoned for later consumption. When dried the seeds turn black. In Indonesia, petai is very popular in the highlands of Java, Sumatra, especially among Batak, Minangkabau and many other people in different cultures of the island. Petai beans or seeds look like broad beans. Like mature broad beans, they may have to be peeled before cooking. Petai has earned its nickname 'stink bean' because its strong smell is very pervasive. It lingers in the mouth and body. Like asparagus, it contains certain amino acids that give a strong smell to one's urine, an effect that can be noticed up to two days after consumption. Like other beans, their complex carbohydrates can also cause strong-smelling. Rice is a cereal foodstuff which forms an important part of the diet of many people worldwide and as such it is a staple food for many. Domesticated rice comprises two species of food crops in the Poaceae ("true grass") family, Oryza sativa and Oryza glaberrima. Oryza sativa is native to tropical and subtropical southern Asia and African rice, Oryza glaberrima, is native to West Africa. The name wild rice is usually used for species of the different but related genus Zizania, both wild and domesticated, although the term may be used for primitive or uncultivated varieties of Oryza. Rice is grown as a monocarpic annual plant, although in tropical areas it can survive as a perennial and can produce a ratoon crop and survive for up to 20 years. Rice can grow to 1–1.8 m tall, occasionally more depending on the variety and soil fertility. The grass has long, slender leaves 50–100 cm long and 2–2.5 cm broad. The small wind-pollinated flowers are produced in a branched arching to pendulous inflorescence 30–50 cm long. The edible seed is a grain (caryopsis) 5–12 mm long and 2–3 mm thick. Rice is a staple food for a large part of the world's human population, especially in tropical Latin America, and East, South and Southeast Asia, making it the second-most consumed cereal grain. A traditional food plant in Africa, Rice has the potential to improve nutrition, boost food security, foster rural development and support sustainable landcare. Rice provides more than one fifth of the calories consumed worldwide by humans. In early 2008, some governments and retailers began rationing supplies of the grain due to fears of a global rice shortage. Rice cultivation is well-suited to countries and regions with low labor costs and high rainfall, as it is very labor-intensive to cultivate and requires plenty of water for cultivation. On the other hand, mechanized cultivation is extremely oil-intensive, more than other food products with the exception of beef and dairy products. Rice can be grown practically anywhere, even on a steep hill or mountain. Although its species are native to South Asia and certain parts of Africa, centuries of trade and exportation have made it commonplace in many cultures. The traditional method for cultivating rice is flooding the fields with or after setting the young seedlings. This simple method requires sound planning and servicing of the water damming and channeling, but reduces the growth of less robust weed and pest plants that have no submerged growth state, and deters vermin. While with rice growing and cultivation the flooding is not mandatory, all other methods of irrigation require higher effort in weed and pest control during growth periods and a different approach for fertilizing the soil. There are many varieties of rice; for many purposes the main distinction is between long- and medium-grain rice. The grains of long-grain rice (high amylose) tend to remain intact after cooking; medium-grain rice (high amylopectin) becomes more sticky. Medium-grain rice is used for sweet dishes, for risotto in Italy and many arrossos -as arròs negre, etc.- in Spain. Rice is cooked by boiling or steaming, and absorbs water during cooking. It can be cooked in just as much water as it absorbs (the absorption method), or in a large quantity of water which is drained before serving (the rapid-boil method). Electric rice cookers, popular in Asia and Latin America, simplify the process of cooking rice. Rice is often heated in oil before boiling, or oil is added to the water; this is thought to make the cooked rice less sticky. In Arab cuisine rice is an ingredient of many soups and dishes with fish, poultry, and other types of meat. It is also used to stuff vegetables or is wrapped in grape leaves. When combined with milk, sugar and honey, it is used to make desserts. In some regions, such as Tabaristan, bread is made using rice flour. Medieval Islamic texts spoke of medical uses for the plant. Rice may also be made into rice porridge (also called congee, okayu, jook, or rice gruel) by adding more water than usual, so that the cooked rice is saturated with water to the point that it becomes very soft, expanded, and fluffy. Rice porridge is commonly eaten as a breakfast food, and is also a traditional food for the sick. Rice may be soaked prior to cooking, which saves fuel, decreases cooking time, minimizes exposure to high temperature and thus decreases the stickiness of the rice. For some varieties, soaking improves the texture of the cooked rice by increasing expansion of the grains. Instant rice differs from parboiled rice in that it is milled, fully cooked and then dried. There is also a significant degradation in taste and texture. A nutritionally superior method of preparing brown rice known as GABA Rice or GBR (Germinated Brown Rice) may be used. This involves soaking washed brown rice for 20 h in warm water (38°C or 100°F) prior to cooking it. This process stimulates germination, which activates various enzymes in the rice. By this method, a result of research carried out for the United Nations International Year of Rice, it is possible to obtain a more complete amino acid profile, including GABA. Cooked rice can contain Bacillus cereus spores, which produce an emetic toxin when left at 4–60 °C (39–140 °F) . When storing cooked rice for use the next day, rapid cooling is advised to reduce the risk of toxin production. Rice flour and starch often are used in batters and breadings to increase crispiness.